I have a webmin on Centos server. I want to create custom cron job. 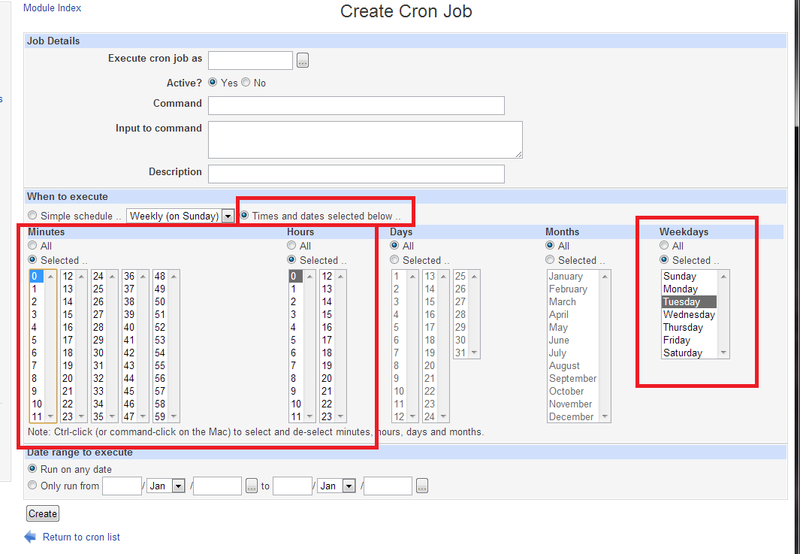 However there is cron job setting options available under "Scheduled Cron Jobs" tab. But if I want to set weekly cron then there it showing me only weekly(on Sunday). Instead of that I want to set cron on every Thursday. I also want to add time it should run at 4:30 pm on every Thursday. Please tell how I can find this option or how I can set as shell command in webmin. This question does not appear to be about server, networking, or related infrastructure administration within the scope defined in the help center. If you want to schedule it with Webmin, the Weekly on Sunday one is just a pre-built schedule. However, you can choose to create your own. My reputation isn't high enough yet to post a picture, so please go here for a screenshot I created for you that shows how to create a schedule in Webmin to run your job every Thursday at midnight. Edit: I misread your question and created my screenshot to show a Tuesday schedule. However, once you look at it, it will be clear to you how to change it to Thursday. Sorry. If the webmin software does not allow you to set it every Thursday, the easiest way is to just edit the crontab file directly using crontab -e. Assuming you have command-line access, just log in as the user you want to run the script, run the command, and edit the crontab file - there are good resources on the internet explaining the cron syntax. If you do not know how to edit the file, or you do not have direct command line access, you can workaround it by running it daily, and having the script check if it is Thursday. Not the answer you're looking for? Browse other questions tagged cron or ask your own question. Where is the cron job? Does cron job remain in effect after computer reboots? EC2 instance sends mail for every succesful or failed cron job - how to stop that?